I’ve previously had disappointing results using coir fiber as a seed-starting medium, but since I do want to minimize use of peat and give alternative materials a fair shake, I’m trying again. Lots of companies out there are working with coir, and the products we’re offered will probably keep getting better. Here’s my latest experiment. I ran into this product at Home Depot recently and decided it was worth trying against old reliable Jiffy pellets (made with peat). For some plants (those with medium-sized seeds, such as tomatoes and peppers) I like starting in pellets, because it’s very controllable and quick, and later on the seedlings pop easily into pots, pellet and all. I don’t use this method for small seeds, because it’s hard to thin extra seedlings, especially if your definition of “thin” is “carefully remove extra seedling and plant it somewhere else, because how could you kill a plant?” And really big seeds don’t stuff easily into the pellet hole. The coconut pellets are much faster to swell up on application of water, saving you a few minutes. On the other hand, they dry out a little faster too, though not so fast that you’ll lose seedlings if you water half a day late. Germination was my real concern. 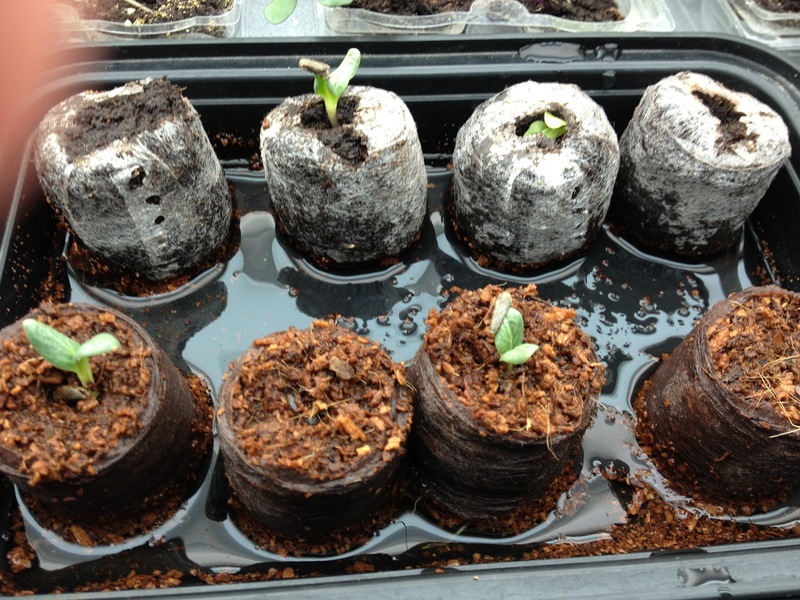 Here’s my little tray of cardoon seedlings, about a week after seeding, freshly watered. It looks like a draw so far; I’m hoping to see the rest pop up soon (and then I will have too many cardoons. This is my second try, with fresh seed, since my 2007 cardoon seed seems to have finally given up). I have a tray of peppers undergoing the same comparison, but none of those has germinated yet. I’ll report back. So far, the newer product appears to be holding its own (it does look like a very odd form of sushi, but I won’t hold that against it). And I did find last year that coir fiber products work fine as potting mix to transplant seedlings into. I’m still looking for a coir-based seed-starting mix that works. ← The Quintessential Root Vegetable! Just like you I have tried to start seeds with coir; I gave up after two years. I don't know what it is, but it just doesn't work. The seedlings are tiny in comparison and tend to dry out fairly quickly. The 2nd year I added fertilizer because I thought, perhaps, the seedlings were not getting enough nutrients. They still did not measure up. 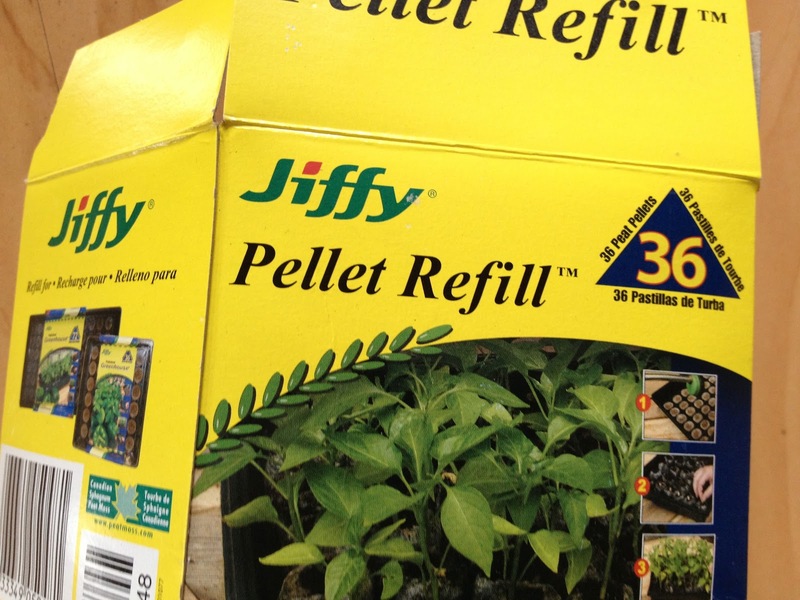 So back to the trusted jiffy pellets, because they do indeed work very well for those larger plants! I'm wondering if it's the shape that's making the coir pellets work (so far) as well as the peat ones – we'll see as things go on. This is my second season using coir and I've had great success. 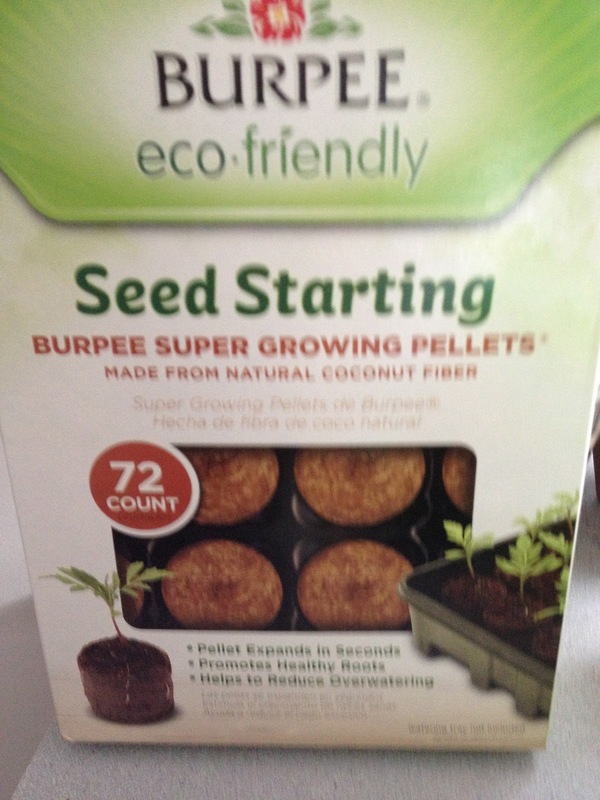 Last year, I used this Burpee product and found them much easier to use than the Jiffy pellets. The Jiffy cases were always falling apart and ending up in weird shapes when they rehydrated. I found the coir pellets to be much more consistent and retain water better. This year, I started making my own pellets out of a giant brick of coir and toilet paper rolls. So far, it still works great. Inventive! I like it! Now, I've used coir from a brick before, both with and without additions such as worm castings and other fertilizer, and had very poor luck. I'm wondering if the product has been improved in the meanwhile, though. I'm going to keep trying.